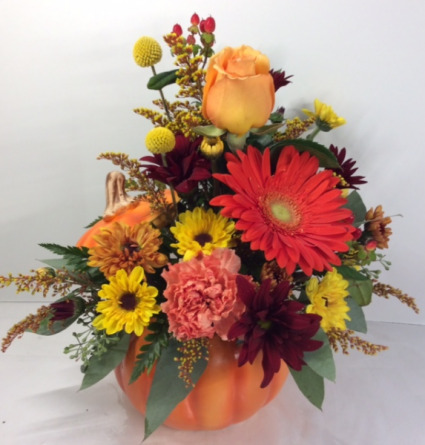 Celebrate the beauty of fall with this colorful mix of orange carnations, a rose, gerbera daisy, wax flower , yellow billy balls and mixed chrysanthemums. It is arranged in a keepsake decorative ceramic pumpkin. 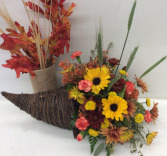 Create a beautiful fall theme on your table this year with this cornucopia filled with seasonal flowers. It has mini sunflowers, wheat, orange mini carnations, pomps and blue berries. 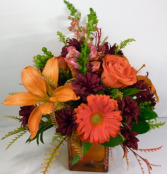 Really capture the essence of fall with this vibrant mixture of lilies, roses , gerbera daisies, snapdragons, mums and berries. It is arranged in a 4" glass cube vase. Orange Cube With Leaf Inside, Seeded Euch, Buplerum, Orange Carns, Pomps Yellow, Butterscotch, Burgundy, Yellow Alstromeria, Peach Rose. 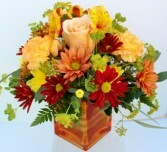 An orange glass cube with a veregated leaf inside , creating an interesting vessel for these gorgeous sunny blooms. Filled with roses, carnations , buplerum and mixed bronze and yellow chrysanthemums , it is a very nice arrangement for many occasions.